The under sink nuclear decay tank was made to complete our product range when a proper station is not possible to set. Theses effluents must be separated from other waste water and brought with a specific evacuation network to a proper decay station. But sometimes these effluent management is impossible. Especially during refurbishments, it is often complicated to set a technical room for wastewater treatment. Therefor, our small sink is a local solution in order to avoid spilling radioactive effluent into the wastewater network. Such as our conventional nuclear medicine decay tanks, this under sink nuclear decay tank is made from High Density Polyethylene. This tank also contains a layer of lead between two layers of plastic in order to preserve the user from radiation. For nuclear medicine departments and laboratory that cannot have a proper nuclear decay station. MEDICAL PROCESS plant permits to store, secure and control the effluent according to the regulations during the period of the radioactivity decrease. 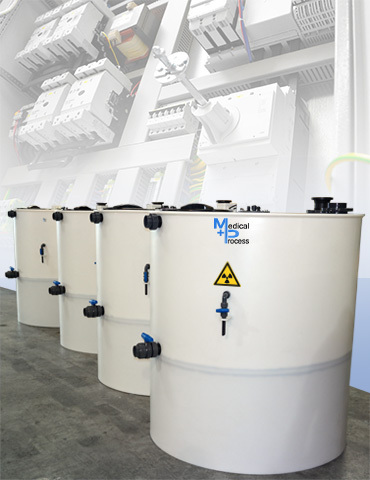 In order to meet the needs of your constraints, our tanks are tailor made after the tank drawings validation. Our technical team will support you upstream of the project to define the appropriate bench and equip it with the right automatic faucet. All our facilities are equipped with safety elements including a general alarm and a automatic stop of the faucet when the high level of the tank is reached.